Introibo ad altare Dei (I will go to the altar of God). This entire serene morning was spent in front of the fireplace, and I read slowly the first twenty-six pages of Joyce’s Ulysses while enjoying the delicious warmth and sounds of the fire. 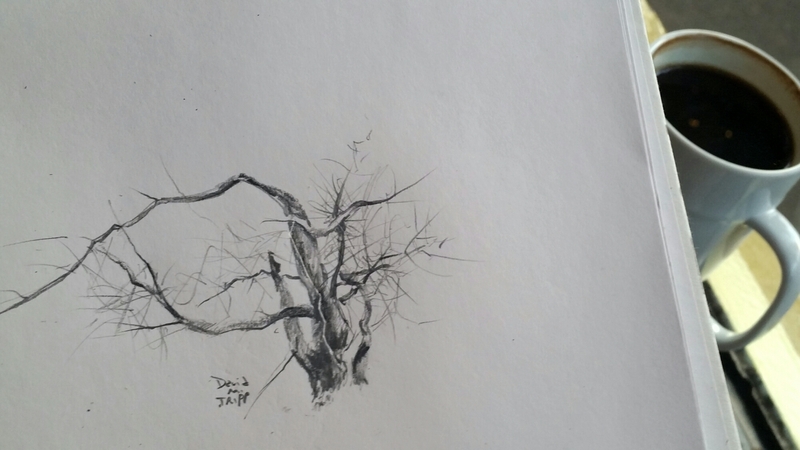 My only break from reading was to draw again the tree outside my living room window. The winter light is so clear and crisp, and the sun was out for the second consecutive morning, lighting up the tree in contrast from its dark background. I’ve placed this 5 x 7″ drawing in an 8 x 10″ mat and have placed it on the market for $40. As I continue the practice, I’m growing more comfortable to rendering tree bark in graphite, and am already looking forward to the next try. Listening to Youtube documentaries last night on James Joyce put me in the mood to re-try Ulysses before the fire this morning. I had never managed to get past the first dozen pages without losing interest, and don’t understand why I’m finding it more readable now. Joyce’s grappling with his Jesuit past parallels my own coping with my Southern Baptist roots. I suppose that is a start. But there is much more–I really enjoy the musicality of Joyce’s language when I am alone and reading aloud. Harold Bloom reminded me of the importance of hearing quality literature, not just reading it. After twenty-six pages, I am stunned at the artistry of Joyce’s writing, and this makes me want to take my own writing more seriously. James Joyce also has much to say to anyone who would follow his/her artistic bliss. He himself fought through so many snares (he called them nets) as he sought to fly above the standard literary canons of his day. I’ve always been aware of the snares, but I feel that my own are more internal–that I have to fight through personal laziness and lethargy and moodiness rather than interference from outside, social forces. In my later years, I’m more conscious of the energy required to create consistently. I’m working on that. You are an artist, are you not, Mr Dedalus? said the dean, glancing up and blinking his pale eyes. The object of the artist is the creation of the beautiful. What the beautiful is is another question. This evening, I’ve been in a James Joyce mood. I read his Portrait of the Artist back in 1988, when I was working nights as a dispatcher for the Fort Worth Police Department. I would begin teaching that fall, and I never forgot the ideas Joyce instilled in me, particularly with this autobiographical creed. I wish to read the work again in its entirety–I have re-read large portions of it throughout the years since I first read the entire work. The Ovid quote that opens Joyce’s book haunts me, as did my first encounters with Andrew Wyeth art. I’ve never been able to explain what it is that I see in particular subjects that is “beautiful” or why the subjects hold me the way that they do. I have stared at winter trees, stripped of their foliage, since 1969 when I first saw the Andrew Wyeth drawings, drybrush sketches, watercolors and egg tempera pieces. 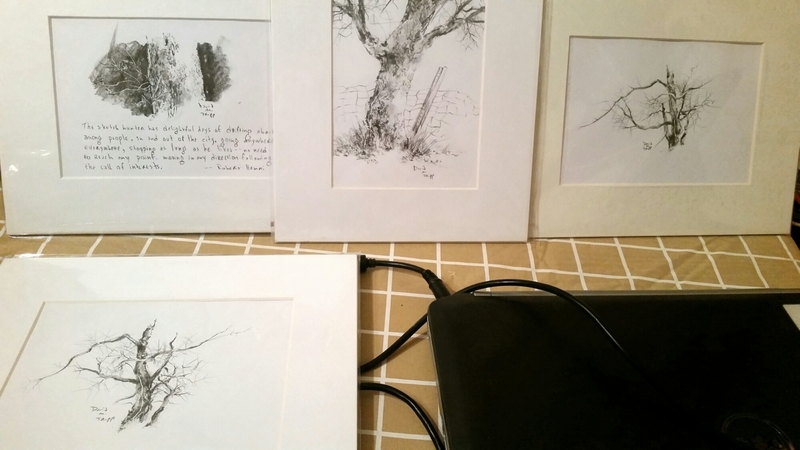 In recent weeks, I’ve been doing drawings of trees from life, then when they were no longer available, drawings from my drawings. 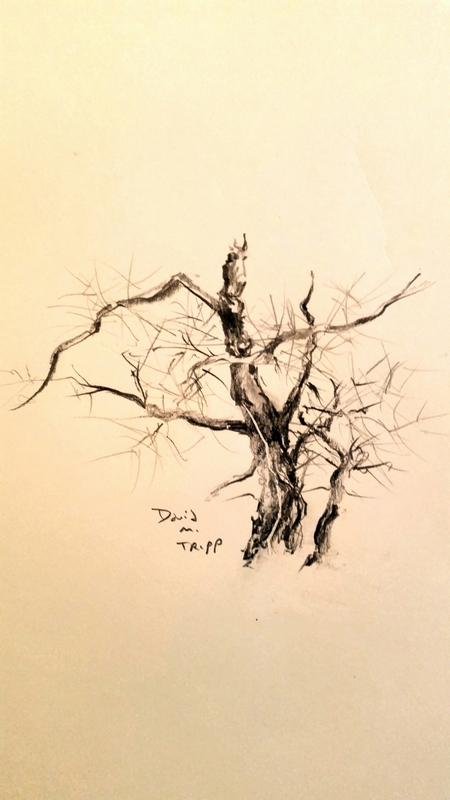 This morning I was enchanted by a tree in the winter light just outside my living room window, and I drew it with a great sense of well-being. Tonight I’m drawing it again, using my first drawing as a model. I also photographed the tree twice today, and plan soon to do drawings from the photo. In time, I plan to switch to watercolor to see how well I can handle these subjects in color. Forgot I had two others. Same prices though-$40 each, any four for $100. I’m offering my latest set of 5 x 7″ tree drawings for $40 each (or all four for $100). They are in 8 x 10″ mats. 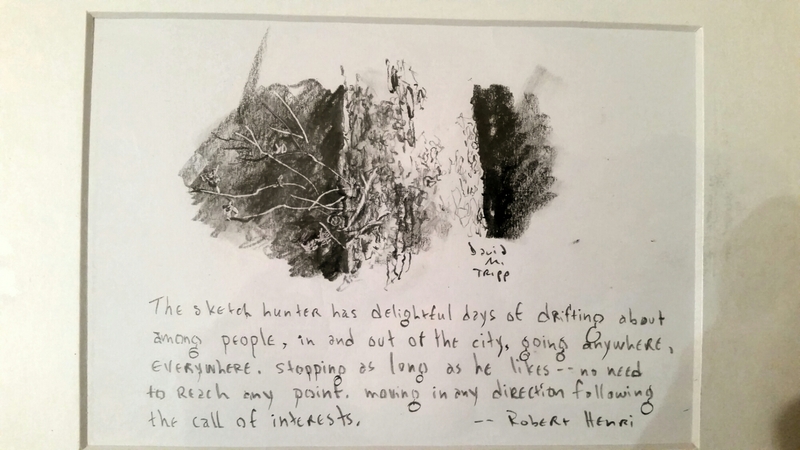 I decided to quote Robert Henri on this drawing before matting and sleeving it for sale. 5 x 7″ drawing in 8 x 10″ white mat–$40. For years, I’ve laughed at that quote, and have asked myself what I believe to be the most sublime music ever created. My vote would have to go to Giovanni Gabrieli’s Canzon septimi toni. This particular morning has been most beautiful because I just received this CD as a late Christmas gift, and the music has filled my house with a sense of good will and lightness of Being. My intention to head for the shower this morning was interrupted when I opened the living room blinds and saw this enormous tree next to my house bathed in the morning winter light. 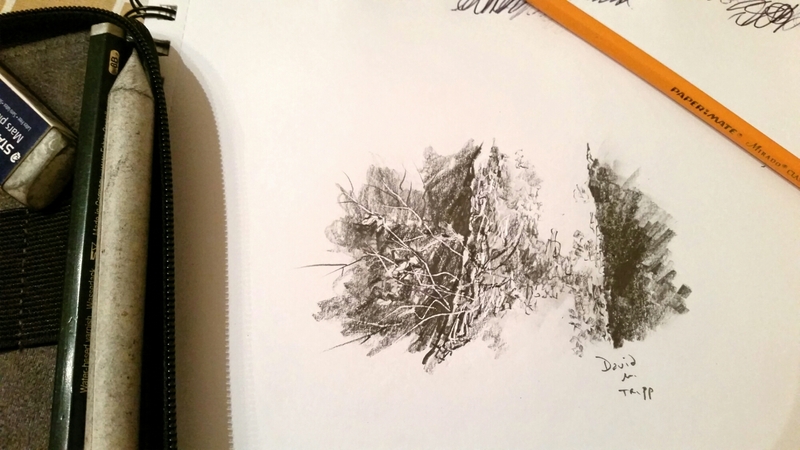 I scrambled for my sketchbook and pencils and scratched out the sketch posted above before showering. I had to, the impulse was so strong. 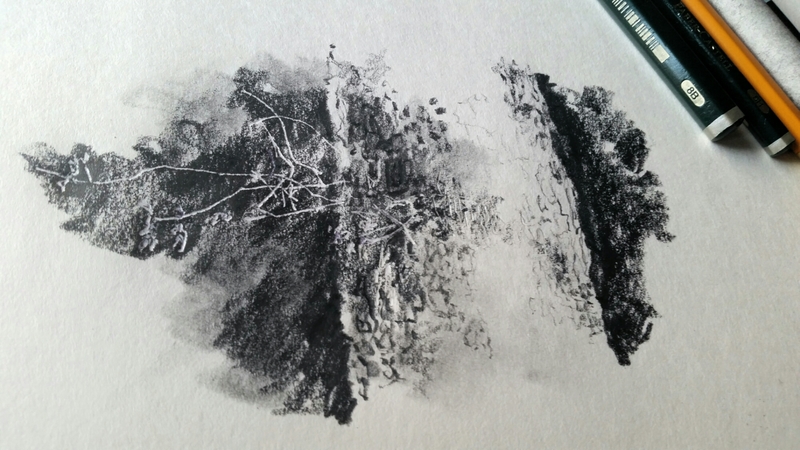 And as I drew, it felt as though the pencils were dancing between my fingers as I worked to keep them inside the boundaries of the tree trunk. 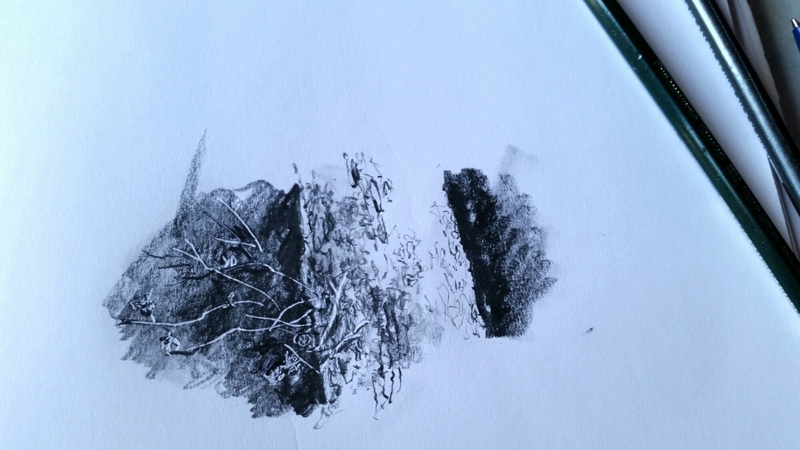 I am still amazed at how little effort it takes to render the textures of tree bark by simply letting the pencil have its way as it skips over the surface of my paper. All I do is twist the pencil back and forth between my fingers, jiggle it about, and vary the pressure of the point against the paper. It does the rest. Last evening, while lounging on a window seat in Espumoso Caffe, I scratched out a couple of tree sketches, marveling at how easy the endeavor was, and began to develop this idea of the contrast between a dancer and a grinder. I seem to cycle between those two. As a dancer, I can flit lightly from book to book, drawing to watercolor, journal to blog, and back again. I seem to be A.D.D., but I’ve had this tendency at least since graduate school–too many interests for one person to keep under wraps. And then there is the other mode, the grinder. As a teacher, I grind out lesson plans, and as an artist, I grind out inventory for commissions and art festivals. Either way, I am producing. It’s just that one way is marked with much more felicity than the other. Both produce results, but one is much more enjoyable. Sometimes I play, and sometimes I work. With a two-week Christmas holiday, I am much more “at play” and am loving it. In the cities, in the studios, there is usually too little time to think matters through. Most things are skimmed, and people often believe they are doing quite a good deal themselves when they are only jostled by others. When I read this last evening, I exploded in my journal for another couple of pages. I love it when writers such as Henri set me off on a tangent of thought. With the holiday more than half over, I am delightful that despite much traveling and social time I have managed to have more quiet time than usual, and have pondered many matters, preparing for this new year. I am excited as 2016 draws near, and have pledged not to get caught by the perennial deadlines and wingnuts that accompany my day job to the extent that there is no time for creative, meaningful thought. Life just isn’t long enough, and I regret in these senior years finding myself often chasing my tail because of schedules that are, in the long run, meaningless. Another thought from Henri: Don’t ever stock your head so full of “learning” that there will be no room left for personal thinking. Drawings are Made by Fools Like Me . . .
. . . but only God can make a tree. I recall the poem “Trees” from the sixth grade when one of my classmates recited it before us all. 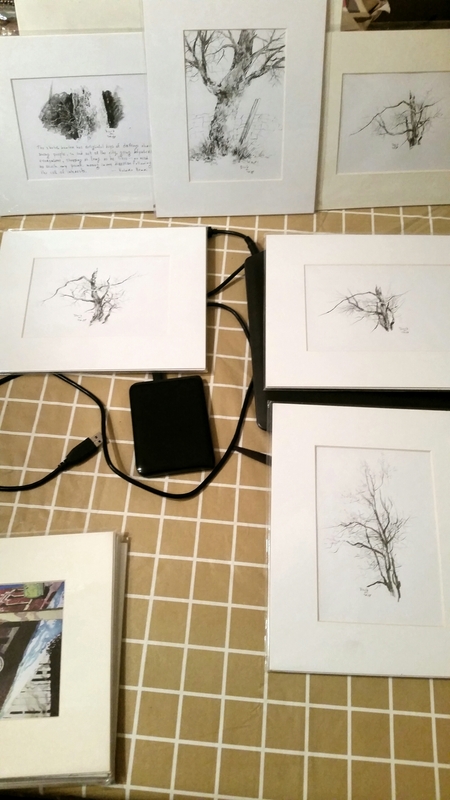 And since ninth grade, I’ve been an avid observer of Andrew Wyeth’s renderings of winter trees in pencil and drybrush. But it wasn’t until the early spring of this year that I actually stared at a leafless tree and drew the entire thing in all its intricate detail. Since then, I’ve been hooked and have tried to push my own pencil and watercolor technique to the edge of the envelope. Sitting in a coffee shop this evening, waiting on a dinner engagement, I’m happy for some quiet reflection and critique of my recent pencil work. I’m just tossing this second sketch onto the blog with no additional commentary. I’m trying to develop a sketching habit to fill in gaps between appointments. I’m enjoying this, so far. I arrived early at the Bishop Arts District where I’ll meet friends for dinner. 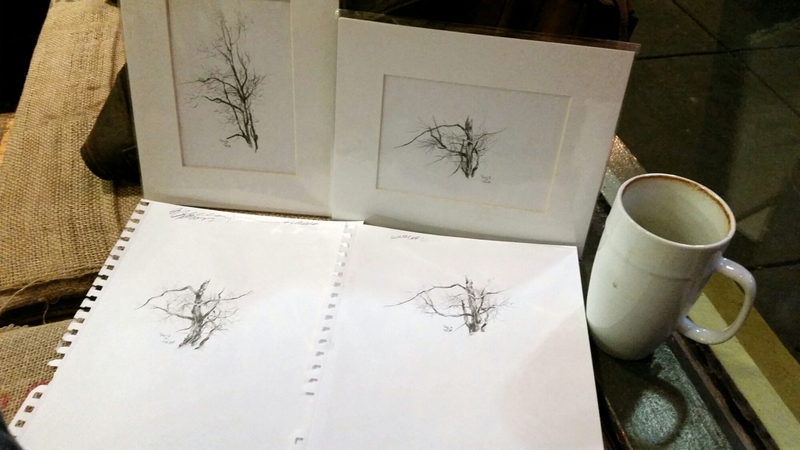 The window seat at Espumoso is inviting, and I decided to do some tree sketching while enjoying a cup of Cafe Americano. I like the metaphor of fencing that Andrew Wyeth used to describe the act of drawing with well-sharpened pencils. He said that drawing winter trees was not for the faint of heart. I agree. With this drawing, I enjoyed thrusting quickly with the pencil points and withdrawing to survey the marks. I didn’t linger too long over the sketch, and am confident that it will look pretty good in a 5 x 7″ white mat. What the verbal artist would like to do would be to find out the secret of the pictorial, to drink at the same fountain. I find myself early this morning on the opposite shore of Henry James. From the banks of the pictorial, I gaze longingly across this vast sea at the distant verbal horizon. As I drink from the literary fountains of Shakespeare, Yeats and Proust, I wonder how one could tap that artesian well of words and produce such wondrous prose and poetry. I acknowledge that I’ve been blessed with a pictorial imagination since early childhood, and have had the good fortune of acquiring a toolbox of skills to reproduce some of this in works of visual art. But still, I feel so enriched when I read texts from these immortal authors who still tug at my heart strings long after they have passed from this earth. Returning this morning to Proust’s Swann’s Way and reading a delightful volume titled Paintings in Proust, I felt the urge to enter the studio and complete a watercolor sketch that I’ve had on my mind since before the Christmas holiday commenced. I’ve finally signed off on it and will price this 8 x 10″ watercolor at $150, matted. I suppose it would have been amazing to live in Paris during the days of la belle epoque. True, the society artists were disappearing, and only the museum-worthy ones are accessible to most of us today, but nevertheless the age was amazing, because the poets and novelists of that period were slowly yielding to the painters in the public’s eye. As cafes began to fill with writers and artists in dialogue, the age became so rich in the arts, and today I still wonder over what it must have been like to sit at the table hearing those discussions. Currently I am blessed to meet almost weekly with a pair of visual artists over coffee, and the exchange of ideas and dreams really fuels my own artistic output. I often wonder if Arlington, Texas could ever become such a garden for fertile minds wishing to explore more deeply the literary and visual arts.